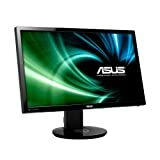 Amazon has the asus VG248QE 24-inch Full HD ergonomic Back-lit led gaming monitor for $218 with free shipping. Sells for $376+ Highest Price. Deals for $209 Lowest Price. Normally $260+.